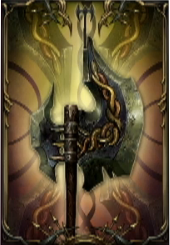 Crusher is one of the Greataxes Weapons in Lords of the Fallen. Weapons are used to deal damage to enemies, and can be improved by slotting gems or completing specific tasks. Weapons scale with specific stats, giving them bonuses based on your character's parameters. "Don't be fooled by those who believe weapons can be unique or have special abilities. It is all about physical power. It does feel special in a way." Physical Damage 130 ?? 130 ? ?